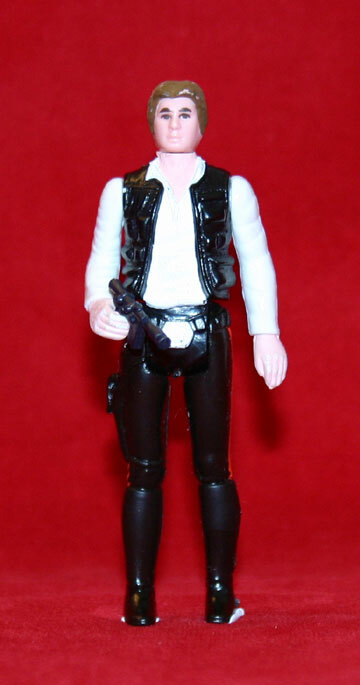 The Han Solo action figure seen here is referred to as a first shot. 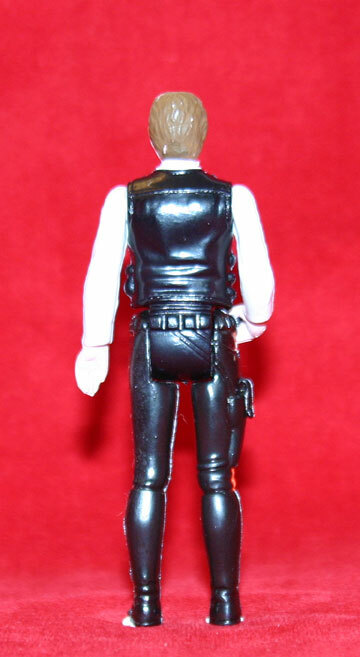 Prototypes of the first 12 Star Wars characters, such as this piece, are quite appealing to collectors interested in collecting these sorts of objects. To many the first 12 action figures are held in high regard since they represent the premiere figures that started the Star Wars action figure phenomenon. 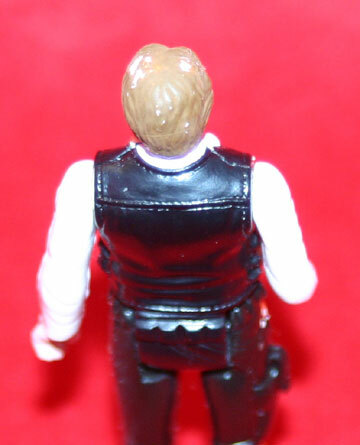 Above we see a photo of the figure's back. Copyright and country of origin markings are noticeably lacking, as is typical for first shot figures since this information is etched into the steel molds after they undergo debugging procedures. Another interesting characteristic is the presence of hand painting throughout the figure. Normal production figures are held together by the torso, which is permanently joined together by a process referred to as sonic welding. Unlike the standard production figures, this torso exhibits torso halves joined by glue. As one can see, a prototype like this differs significantly in many aspects from a production figure. The way these differences relate to the production process make this figure an interesting artifact of Kenner history.